This tutorial is about setting up apache opennlp with maven in Eclipse or IntellijIdea. Here we will be creating an example using Sentence Detector componenet provided by apache opennlp.For this purpose we will be using en-sent.bin file that is trained on opennlp training data. So let us get started. NLP stands for Neuro-Linguistic Programming. Neuro refers to your neurology; Linguistic refers to language; programming refers to how that neural language functions. In other words, learning NLP is like learning the language of your own mind and its referred as Natural Language Processing. There are many existing NLP libraries available online which are already trained on most common NLP tasks such as NLTK, OpenNLP, Standford CoreNLP. 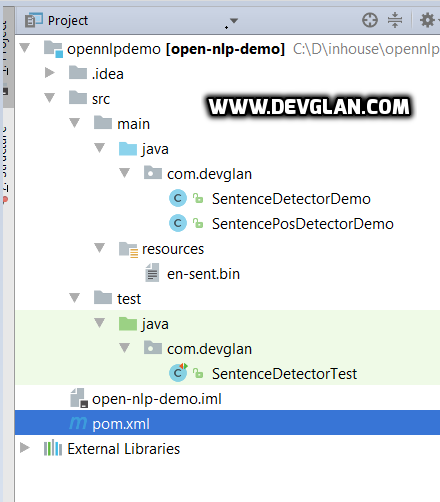 In this post we will be discussing about OpenNLP and provide a basic example to get started with OpenNLP to detect sentences using maven and eclipse IDE. opennlp-tools: It provides concrete implementations of NLP algorithms such as sentence splitting, POS-tagging etc. SentenceDetector can detect sentences from a part of speech. OpenNLP has predefined componenet as en-sent.bin which is trained to identify sentences from a part of speech. We have this file - en-sent.bin present inside /resources folder. Once this file is loaded, we can call sentDetect() to detect the sentences from a part of speech. * Created by only2dhir on 08-07-2017. OpenNlp also provides ways to detect the positions of the sentences in a raw text. We can use sentPosDetect() to identify the position of the sentences from a raw text. Following is an example. Following are some test cases to detect sentences and its position using apache OpenNLP.